Introducing The Weekly Roundup. Starting this week, every week I will post a list of some of the best things I've found in the last seven days. The Point is a fable conceived by Harry Nilsson, who later developed it into a animated film featuring original songs he had written. It first aired on television in 1971, and was later released on VHS and DVD. If you were born in the 1970s or early 1980s to liberally-minded parents, you may have watched this movie as a kid. Otherwise, you've probably never heard of it before. Like many animated films made by hippies for children (I'm talking about you, Paul and Linda McCartney), it is impossible to watch The Point and not be reminded of an early music video or an acid trip. It was a little overwhelming for me to understand as a child, but I loved this movie anyway, because the video release version is narrated by Ringo Starr. Between listening to The Beatles and watching Shining Time Station, I developed a deep love of Ringo Starr from about the age of 5 onward. It took some digging but I found the entire movie on YouTube in 10min clips. This is hiphop at its best. I was brought up to believe in the old proverb, "it takes a village to raise a child", and my mother practiced it. My Unitarian Universalist church was my village, and many different adults from the community played an important role in supporting me, listening to me, and teaching me and all my peers. It is nice to see an entire town, which is much larger than a church and therefore much harder to organize, come together in a similar way. Think if I use the above accronym enough it will catch on? I suppose it will never be as amazing as this, though. 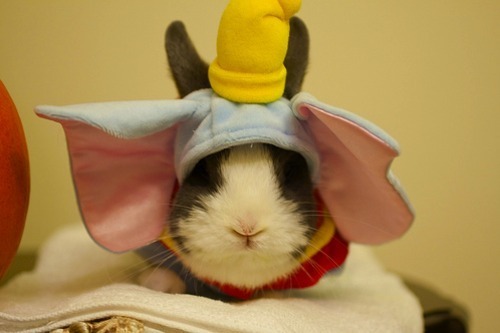 I don't know how they found a miniature Dumbo costume, got it on the rabbit, and then got the rabbit to hold still, but I also don't care. It's SFC. Just like many children, when I was a kid I owned a bunch of LEGOs. Unlike many adults, I still own a bunch of LEGOs. Imagine my surprise then when I discovered something this wonderful had been around since spring without my knowledge: an exact replica of the famous Fallingwater designed by the renowned architect, Frank Lloyd Wright! I am absolutely in love. It look all my power not to buy this wonder. I finally managed to reason with myself by remembering that I did not have enough disposable money to spend $100 on LEGOs instead of car repairs. The set is part of the LEGO Architecture series. And while Fallingwater® is arguably the most impressive of the collection, there many interesting buildings featured. Pogo makes these video mashups of childrens movies set to beautiful ambient music tracks that sample audio clips from the movie. A friend recently sent me the Bangarang video, and once I checked out the channel it was on, I recognized the Alice video too. My favorite is below. It's made from the movie version of The Secret Garden that was released in 1993, the same year I read the book for the first time.